CARACAS - In Venezuela the shortage is not only about meat, flour, coffee, oncology drugs, vehicle batteries and toiletries. There are also no aircrafts to travel to other countries. f a nation in which flying has become a hard to find luxury. “Due to the current currency exchange situation in Venezuela, which does not allow for profitable connections to and from this country, Alitalia decided to temporarily suspend its flights from Rome to Caracas to Rome starting June 2,” the company said , which counts among its clients numerous transalpine migrants. The State has almost 4,000 billion in debt to airlines because of the exchange controls imposed by Hugo Chavez 11 years ago. 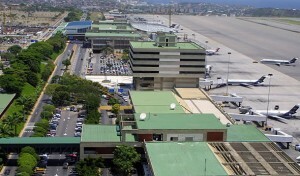 The passengers buy their tickets in bolivars and the State should change them to dollars, for the airlines to report them to their headquarters. But for months, in some cases more than a year, the State has stopped doing so because of the economic earthquake affecting the country. Alitalia joined Air Canada to become the first companies to leave Venezuela in March despite Nicolas Maduro’s government threats, who denounced anti-revolutionary maneuvers against his government. The next may be Lufthansa, which announced yesterday that it suspends ticket sales. Other airlines, most of them, reduced the number of flights and size of aircraft, in an effort to stay in the country. As Colombia's Avianca, once one of the airlines with the most performed operations and now has only a quarter of its seats booked. Few seats and very expensive. A flight next week from Caracas to Bogota costs about 20,000 bolivars, equivalent to 2000 dollars if the Sicad1 exchange rate is applied, as preached by the government. Prices soar to 5000 dollars to travel to Europe. Of course that is if the ticket is found in a lottery from which few come out winners. And with time limitations: you can only buy one month ahead on most airlines.